So, you’ve picked a girl you want to marry!!! You’ve chosen and purchased a ring. Once you’ve gone through the nerve-wracking decision of choosing a partner for life, the tough decision of whether to buy the traditional round brilliant engagement ring or a unique style such as an emerald cut diamond engagement ring, you’ll want to ensure the proposal itself is as amazing as you both. There are lots of romantic ways to propose, but here are our top 10 most romantic picks! #1. Take her somewhere amazing! More and more couples are planning engagement proposals around vacations in order to offer up romantic opportunities for focus on just the two of you. Exploring somewhere new is the perfect metaphor for the journey you’ll be taking as a married couple. It takes some planning and careful thought, but it can set the stage for a memorable proposal that has romance written all over it. #2. Create a romantic scavenger hunt that can be as short and sweet or as long and complex as you like. Incorporate details and clues from your love story so that every step through the scavenger hunt is a trip down memory lane and a reminder of all the reasons you chose her to begin with! The prize at the end is a beautiful ring and a life-long commitment! #3. Create a romantic evening in. Making a memory in your home is also sweet and romantic – you can get pretty elaborate even at home! Prepare or order in a favorite meal. Set up flowers or candles. Make sure to incorporate her favorite things to build a beautiful moment! Privacy is a bonus in this loving gesture. #4. Pop the question in a favorite restaurant. Public proposals may not be for everyone, but you know your girl best and can decide if this is something she’d love. Get help from staff at a favorite restaurant and add special touches ranging from flowers to fancy deserts to lead up to your proposal. #5. Do you have kids? Get your babies (or fur babies!!) in on the action by making them part of the proposal. This reinforces the commitment you’re making to your entire family while including those you both love the most! #6. Hike to a high point with a dizzying view & and drop to one knee with that ring! She’ll feel like she’s floating above the whole world! If hiking is a hobby you both share a love for, this is a sweet and thoughtful way to propose. #7. No money or vacation days to burn on an extravagant vacation? Find a local attraction such as a museum, art gallery or greenhouse. Many of us take for granted the hot spots in our area because they’ve always simply been there. You can find classic beauty in nearly any town that will create the perfect (nearby) backdrop for your proposal. #8. Live somewhere snowy? Weaving a memory around the first snowfall, an ice skating outing, snowshoeing or building a snowman is a sweet and simple way to propose memorably! #9. Take a hot air balloon ride and take proposing to new heights! The two of you (as well as a very closely wedged in plus one – the operator) will be snuggled up already and you can’t beat the view! #10. Document the occasion. Find a plausible story to explain a photo shoot of the two of you. You have a friend who’s just starting out, you won a photography session, you want a gift for your parents – you name it! You’ll be all dressed up and have a good reason to visit beautiful places. Double bonus – your moment will be caught on camera forever! Regardless of what you choose for your romantic proposal, always remember that the love and thought you put into are what matter most! 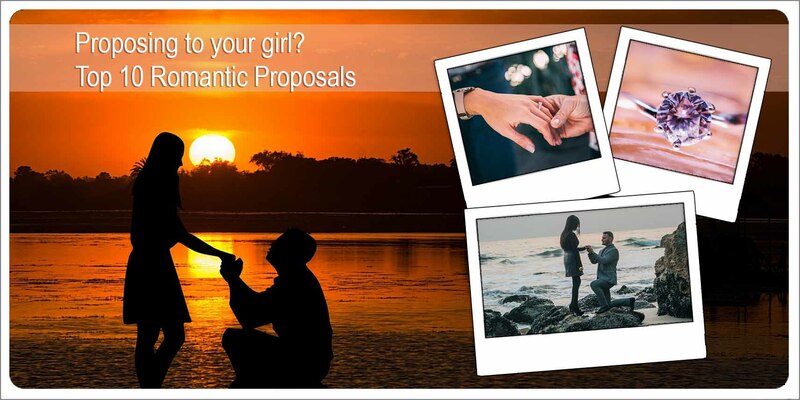 Have you chosen a romantic way to propose? Also choose the right engagement ring from https://ecodiamond.com/engagement-rings/lab-created-diamonds-engagement-rings.